DISCLOSURE: I was given a coupon for me and a friend to receive a free Old Navy Active top and bottom, as a member of the Old Navy Style Council on Crowdtap. All opinions are my own. I just delivered my fourth child about a week ago. I gained about 45 pounds with this pregnancy! What would be a better motivator to get rid of the baby weight than some cute new activewear? Luckily, I was selected to receive a free top and bottom from Old Navy's latest Active line and I got to share this opportunity with a friend! 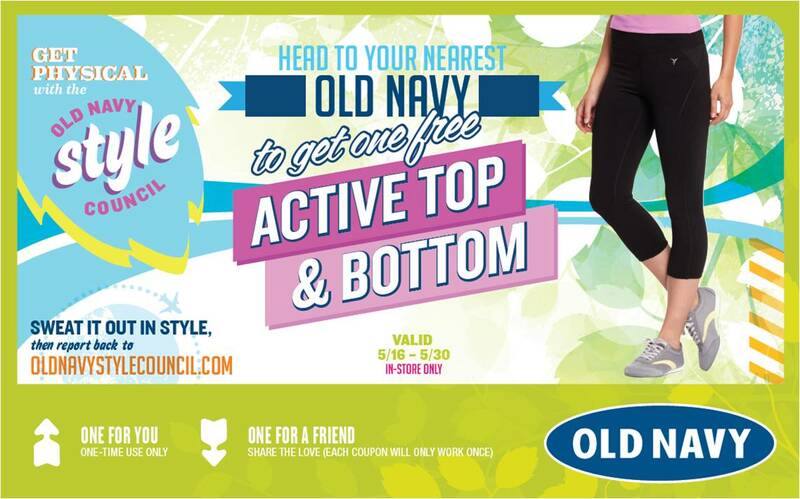 Old Navy's line of Activewear include pieces for running, yoga as well as general workout wear. Some items feature Old Navy's GoDRY moisture-wicking fabric. They also have a line of compression tanks, jackets, sport bras, capris, shorts and pants. We had about a two-week period where we could redeem our coupons and my scheduled C-section was pretty much right in the middle. I decided it was best to try and go before my C-section because I wasn't sure how I'd be after the surgery. [Which was actually a good move, since recovery has been ROUGH!] My local Old Navy does carry maternity items, but as usual, they didn't carry many maternity activewear. I decided to try on regular size activewear, but in a bigger size than what I normally wear. But, I used my coupon on my regular size. Our store has a pretty large section dedicated to the Active line. They had plenty of tops and bottoms to choose from, though size was sometimes an issue. Some items weren't available in the size we wanted. Time to try them on! Here's my sister wearing the Active by Old Navy Padded Cami ($19.94) in Grey Melange, the Active by Old Navy Side-Mesh Running Shorts (3") ($15.00) in Royal Rowena, and a pair of Active Sneakers ($19.94). They're no longer on the website, but were available in our store for purchase. My sister really liked the tank and decided this was going to be the top she got before she tried anything else on! When we went in for the sample share, I was exactly one week away from delivering and actually had about an hour or two of strong contractions that night. So, I wasn't exactly thrilled about having my picture taken! But here I am wearing the Active by Old Navy Mesh-Bubble Tank ($16.94) in Royal Rowena and the Active by Old Navy Side-Mesh Running Shorts (3") ($15.00) in Royal Rowena. I didn't care for the top and liked the shorts, but not the pattern. Next, my sister tried on a super bright outfit! Here, she's wearing the Active by Old Navy Mesh-Bubble Tank ($16.94) in Electric Neon and the Active by Old Navy Side-Mesh Running Shorts (3") ($15.00) in Electric Neon. My turn to wear the neon! Here I am wearing the Active by Old Navy Mesh Top ($12.94) in Electric Neon and the Active by Old Navy Compression Capris ($22.94) in Neon Alarm Clock. I liked the shirt, but OH MY GOD! Those compression capris were so hard to put on with my big pregnant belly in the way! In this picture, my sister is wearing the Patterned Burn-Out Tank ($12.94) in Icy Aqua and the Active by Old Navy Compression Leggings ($26.94) in Blackjack. She didn't really care for the top, but really liked the leggings and decided to use the coupon on them. This next outfit was one of my favorites, but I ended up getting something different. I'm considering going back and getting it since there's a 30% off your entire purchase sale going on today and tomorrow! I'm wearing the Active by Old Navy Padded Cami ($19.94) in Icy Aqua and the Active by Old Navy Side-Mesh Running Shorts (3") ($15.00) in Carbon Stripe. I really liked the color of the tank top and it was nice that it came with a built-in shelf bra. I liked the shorts, too, but decided on a different color, since most of my running shorts are either grey or black. I really didn't like the next outfit I tried on. I didn't even leave the dressing room! Granted, maybe if I wasn't 9 months pregnant, I would have thought differently about the top. I'm wearing the Active by Old Navy Mesh-Bubble Tank ($16.94) in Eternal Flame and the Active by Old Navy Compression Leggings ($26.94) in Blackjack. If the compression capris were hard to put on, these leggings were even harder! Next, my sister tried on the Active by Old Navy Mesh Top ($12.94) in Grayscale and the Active by Old Navy Compression Pants ($26.94) in Grey Melange. I tried on one last outfit. I liked the shirt and was going to get it, but decided on a different color at the last minute. I'm wearing the Active by Old Navy Mesh Top ($12.94) in Carbon 2 and the Active by Old Navy Compression Capris (19") ($22.94) in Carbon 2. Check out at the store went smoothly. We weren't questioned at all about the coupons and everything went through fine. Here's the outfit I ended up getting. It doesn't fit yet, since I'm only 1 week post op. I'm hoping by the time I get the "okay" from the OB to work out (in about 5 weeks), I'll be able to wear these! Would you recommend it? Yes! Old Navy has a great line of activewear that's affordable and holds up pretty well. The current line comes in a great assortment of colors and patterns, certain to have something that suits everyone's tastes. How much does it cost? The whole line has come down in price considerably since its introduction. Women's Active items range in price from $12.94 to $34.94.